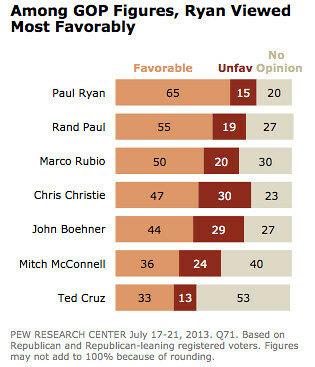 Paul Ryan, Rand Paul, Marco Rubio are Republican voters' favorite Republicans. The latest Pew Research poll scrutinizes Republicans and voters who “lean Republican,” asking them whom they like in the party and what the party needs to change. This chart suggests that two politicians who’ve taken leads on immigration reform—and a third who gave prominent speeches in favor of the concept—remain the Republicans most admired by Republicans. 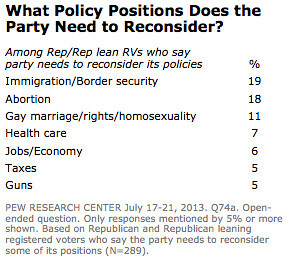 When asked what issues demand some new thinking from the party, the winner, again, is immigration. The abortion number is a bit of a surprise, until you consider how many “moderate Republicans” are grabbed in the sample: “44% of moderate non-Tea Party Republicans say the party is too conservative on abortion.” That’s in the wake of abortion restriction bills passing in a large group of Republican-heavy states, from Texas to North Carolina to North Dakota.